Start slowly with your new strength training program. You jog, you do dance aerobics and you walk just about everywhere you go, but your muscles just don't seem to have the definition and tone you'd like to see. You need some strength training! You don't have to go to the gym and start lifting heavy barbells or working out on a confusing weight machine -- you can do strength training to firm and tone your muscles right at home. You won't end up looking like a professional body builder by doing some basic strength training exercises, but your muscles will be stronger, leaner and well-toned. These exercises couldn't be easier for a beginner, but they pack a punch when it comes to strengthening and toning your arms. Start with arm circles by grabbing some 2-pound dumbbells if you have them, or just use a couple large cans of vegetables. Stand with your legs hip-width apart and stretch your arms out from your shoulders so that your body forms a “T” shape. Drop your shoulders slightly and gently squeeze your shoulder blades together, just a little. Move your arms in a circle forward 10 times and then backward 10 times. Use those cans of beans or dumbbells to do shoulder presses next. Bring the weights to your shoulders by bending your elbows and then press the weight over your head by extending your arms straight up. Bring the weights back to your chest to work your triceps on the back of your arms. Lead forward with your knees slightly bent. Straighten one arm and lift it straight back behind your body until you feel the back of your arm stretch. Do 10 repetitions on each side. Strong legs are not only important for endurance and balance, but they also look great. Work your hamstrings on the back of your legs through some stretches to increase flexibility and tone your muscles. Stand with your feet slightly apart and then bend over from your hips until your elbows touch your knees. Bend your knees slightly and then straighten them again. The calf muscles on the back of your lower leg are strengthened by doing calf lifts. Nothing could be easier than standing on your toes. Do calf raises by standing with your toes slightly turned out. Lift your heels until your weight is supported by the balls of your feet. Lower your heels and raise them. The inner thigh can be very difficult to strengthen and tone. Clams are a good way for beginners to work this difficult area. Lie on one side with your knees bent and one leg on top of the other. Lift your top knee upward and back. Keep your feet together. Pump up the effectiveness of this exercise by wrapping a resistance band around your legs just above your knees. A strong core, or abdominal muscles, helps you feel stronger all over. You can strengthen and tone your core muscles by doing beginner wall crunches. Lie on your back close to a wall and bend your knees. Place your feet flat on the wall and scoot back or forward until your shins are parallel to the floor. Squeeze your belly tight, cross your arms over your chest and then lift your shoulders off the floor. Beginners can do a modified plank that works the core muscles, but is a little easier to perform than a regular plank. Lie on your stomach and rest your weight on your forearms and knees. Make your body straight from your head to your heels. Lift your body off the floor using your knees and elbows. Hold for a few seconds and then relax. Don't neglect your back muscles when it comes to strengthening and toning. You can do the shoulder blade squeeze just about anywhere, anytime you want to work your upper back. Sit up straight or stand up straight. Drop your shoulders slightly and tuck your chin a bit. Squeeze your shoulder blades together and hold for five to 10 seconds. Arm-leg raises will strengthen your lower back. You have to get on the floor for this one, so maybe the office isn't the best place to do this one. Lie on your stomach and stretch your legs out. Stretch your arms out above your head. Lift your right leg and your left arm straight up toward the ceiling. Hold for a few seconds and then relax. Repeat on the other side. 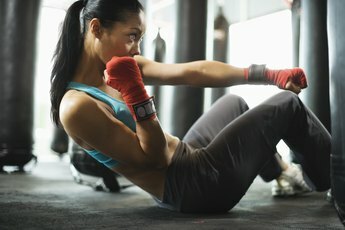 What Muscles Do Reverse Crunches Work?